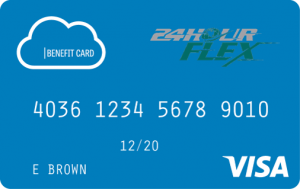 The 24HourFlex Debit Card is the most convenient way for you to access your FSA funds, because it allows you to pay for eligible medical and dependent care expenses at eligible merchants using money directly from your account instead of paying out of pocket. The 24HourFlex Debit Card functions just like a normal debit card, only allowing you to spend up to the available balance in your account. For more information, take a look at our Debit Card Frequently Asked Questions section below. Only when needed, 24HourFlex will ask you to submit an itemized receipt or statement to verify that you used your debit card to pay for an eligible expense. What happens when we ask for this kind of verification? Click here or the button below for an explanation of the process from start to finish, including information on your timeline for submitting documentation, when card suspension may occur, and sample notifications you might receive from 24HourFlex. I Enrolled in an FSA. How and When Do I Get My Debit Card? Cards are automatically generated and mailed upon enrollment. You should receive your cards within 7 to 10 business days of your enrollment being processed. I Just Received My Debit Card. How Do I Activate It? You can activate your card by calling 1-866-898-9795. This number can also be found on the sticker on the front of your card. Why Do I Need to Submit Receipts? 3. The transaction occurred at a location that had an inventory system in place that kept track of all eligible items, allowing you to know at the point of sale whether you were paying for an eligible item or not. If a transaction is automatically verified, then a receipt may not be requested. In all other cases, 24HourFlex will proactively reach out to you and request documentation. This occurs because we need more information to prove that an expense is eligible (usually we can see the amount spent and the merchant code, but we cannot see the items you purchased). Dental and vision expenses commonly require receipts, simply because (1) there are many dental and/or vision products and services that are not FSA-eligible (e.g. teeth whitening) and (2) many dental and vision providers do not fall into a standard merchant category (e.g. Costco). For more information on submitting documentation to verify a card transaction, click here. How Do I Know If I Need to Submit a Receipt? We will notify you when a receipt is required to verify an expense. Notifications are issued by email, regular mail (if you have no email address), and via the Message Center in your Consumer Portal. Click here for more information. I Received a Request for More Information (RMI). What Do I Do? For more information, please click here to view our guide to understanding your Request for More Information (RMI). What Happens if I Don’t Submit a Receipt? For every transaction that requires a receipt, you will receive multiple reminders to submit your receipts via email, snail mail (if you do not have an email), and in the Message Center of your Consumer Portal. If you do not submit a receipt to verify an expense within 30 days of the card transaction, your debit card will be suspended. After 45 days, the amount of the unverified transaction will be treated as an amount owed that you will need to repay to your account. For more information, visit our page that outlines the Debit Card follow-up processes and provides a timeline for submitting receipts. You can use your Debit Card at any location that is either set with an MCC code that identifies your purchase or service as a medical good or has an inventory control system that automatically recognizes your purchased items as being eligible for a Flexible Spending Account or Health Savings Account. To find specific locations where you can use your Debit Card, follow the link below and enter a location. If your location appears, your Debit Card will be accepted! How Do I Repay an Amount Owed? In the event of an expense not meeting IRS guidelines for eligibility, an amount owed will be created on your account. The repayment will be applied back to your available balance. Making the repayment is quick and easy. Please click here to view our guide to making repayments. I tried to use my debit card for an eligible expense, but my card did not work. What happened? All Visa card transactions contain a 4 digit code. Your 24HourFlex Visa has only medical, dental and vision codes that will allow the card to be used at eligible providers. If you received a denial based on the provider’s MCC (merchant category code), you can pay out of pocket and then either submit a claim (FSA) or request a distribution (HSA) to be reimbursed for your eligible expenses. My doctor asked me to pre-pay for expenses that have not occurred yet. Is that eligible? IRS regulations do not allow for pre-payment of expenses. An expense is eligible only once it has already occurred. You will need to file a claim after the service has been performed with a statement showing the date of service and the final amount charged to be reimbursed. If you have used your card already, you can ask your provider for a credit to your 24HourFlex Debit Card. Then you can either pay out of pocket and submit the claims as the dates of service happen, or use your 24HourFlex Debit Card to pay for services that occurred on the day you are paying. Wondering if your card is active or suspended? Read our post about how to check your card status. Click here to learn how to report your card as lost or stolen and to request a replacement card. Need an extra card for your dependent or spouse? Click here to read how to order additional cards. After you use your 24HourFlex Debit Card, you may need to submit a receipt to verify that you spent your money on an FSA-eligible expense. Click here to learn about three options for submitting receipts. Did you know you can purchase FSA items online? The FSA Store website makes using your FSA money easy, providing a large selection of items that are guaranteed to be FSA-approved. Click here to visit the FSA Store website.